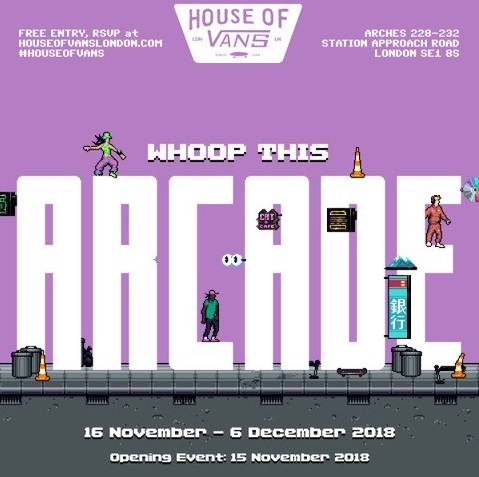 IAMSOUND repped artist is also turning the gallery space into a gaming paradise for the occasion - with hand-built table-top arcade cabinets featuring three of Whoopi's custom-made skate games, each set in London, LA and Tokyo. Performing skate tricks to the beat of songs to score points, players can perfect their gaming prowess and learn about the creative process behind the show. Tickets are free, and there's also a special opening of the show on Thursday 15 November at 6pm - those who RSVP for the night will get drinks, DJs and be able to meet Whoopi for a guided tour of the space. For more information and to RSVP for the opening night, visit the House of Vans website. Open through Thurs - Sun, from 6pm. Opening Night (RSVP ONLY) is Thurs 15th November 2018, 6pm. The House of Vans is the physical manifestation of the culture and creativity that have defined the Vans brand since 1966. Always embracing and fuelling creative expression through art, music, skateboarding, BMX, street culture and fashion, the space offers a solid platform for the local communities to experience and engage with Vans’ ‘Off The Wall’ sprit. Calling all female shredders out there, the raddest Girls Skate Night in town is back!